Congratulations and an early Christmas present for the UK Manufacturing Apprentice of December, Bradley Brame of Suffolk based Herga Technology. Bradley is seen pictured collecting this months prize to go with the £100 Amazon Vouchers. 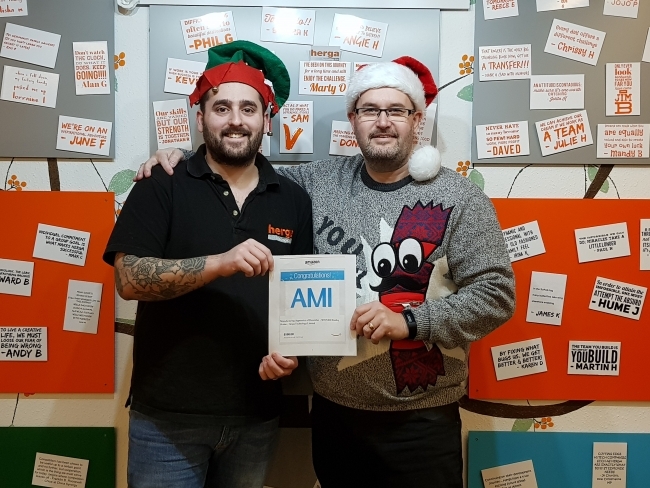 Bradley fills the last space of the 12 monthly winners in the running for the AMI UK Manufacturing Apprentice of 2018, with the overall winner of the year being announced in January. The competition was launched to find and recognise the very best apprentices currently working within the UK manufacturing industry. Herga Technology recently completed 70 years manufacturing service, designs and manufactures many different types of footswitch, hand control and sensor solution technologies. Bradley started his Performing Engineering Operations – Level 2 apprenticeship with Herga in December 2017. Challenged immediately by an 8-week enforced absence, he quickly caught up with work when he returned in March 2018. Bradley approaches all tasks with great positivity often commenting at the end “I did not know that but am pleased I do now!!”. Throughout the course he has wanted to learn as much as he can about practical aspects of a high volume, engineering manufacturing operations. From machining/repair workshop activities, to designing improved nut-heads and preparing method-manuals. Bradley has a genuine thirst for knowledge and how manufacturing efficiency can be improved. He has also challenged himself to complete his 21 month course within 12 months, which he is on target to complete. Bradley is the first apprentice Herga has had in some years and it has really exciting for them to support the development of new talent within the business. It was a process very well supported by all departments, senior management and stakeholders. The benefits of bringing new talent into any business gives everyone a new outlook of products, process, systems and their own people management skills. Herga are so impressed with Bradley, they have already offered him a Full Time role as a Production Support Technician in January 2019, supporting him with further development and training throughout the year.